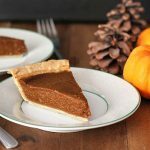 This Quick and Easy Vegan Pumpkin Pie recipe with shortcuts will save you lots of time so you can move on to other things when cooking multiple dishes during the holidays! Anyone who has prepared a big holiday meal knows that to stay on track, A LOT has to be going on at the same time and all of them need your attention. 2 things boiling, 1 thing in the oven, 4 things waiting to be chopped…a hungry child…or two. You know how it goes…preparing a holiday meal is no joke! So any time I can take a shortcut, I take it. This quick and easy vegan pumpkin pie has a couple of small shortcuts that will have you moving on to other things in the kitchen that are begging for your attention. Pumpkin pie is a staple at Thanksgiving for us. My kids love it, so it’s always requested. I even make one at Christmas. Is pumpkin pie at Christmas a thing? Or is that just us? Either way, it’s always a part of our dessert menu during the holidays. I usually go all out and I make the crust myself, but sometimes, a shortcut is needed. (If time is not an issue, you may want to check out my vegan chocolate pumpkin pie recipe). 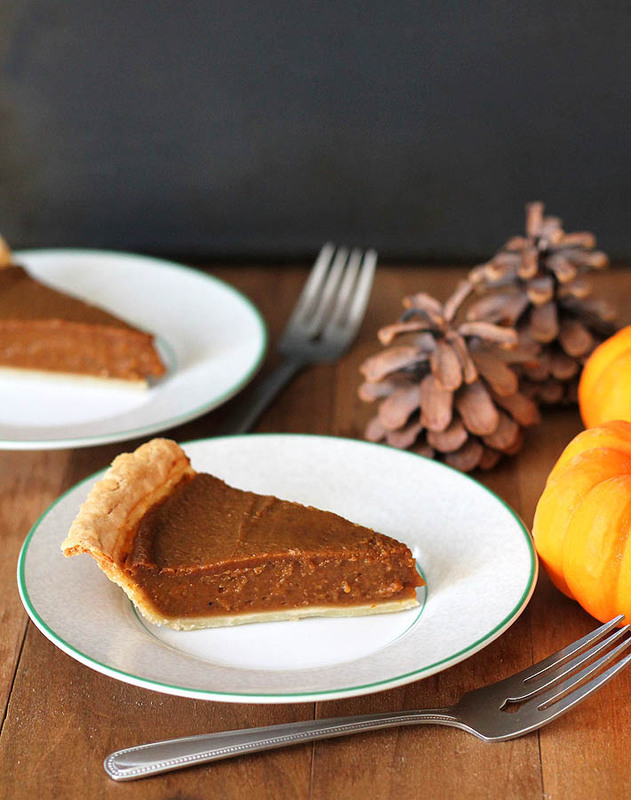 What makes this quick and easy vegan pumpkin pie quick and easy? And why will it save time? The most time-consuming part of making any pie is usually the crust. The pie crust used in this recipe is pre-made and store-bought. I also forego all of the separate spices and opt for pre-mixed pumpkin spice mix. 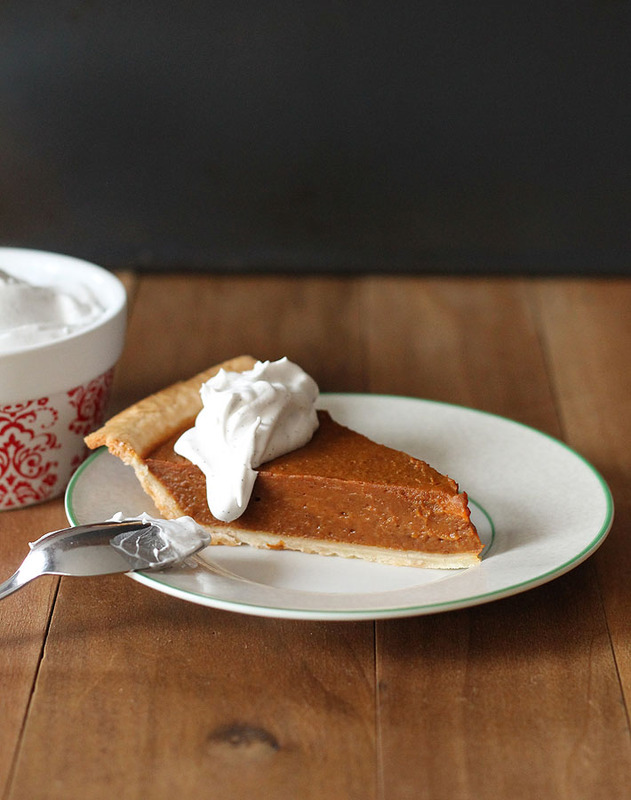 And those two things are what makes this easy vegan pumpkin pie a time saver. You may be wondering why I don’t use a canned pumpkin pie mix in this recipe, because THAT would be the ultimate time-saving way to make pumpkin pie. 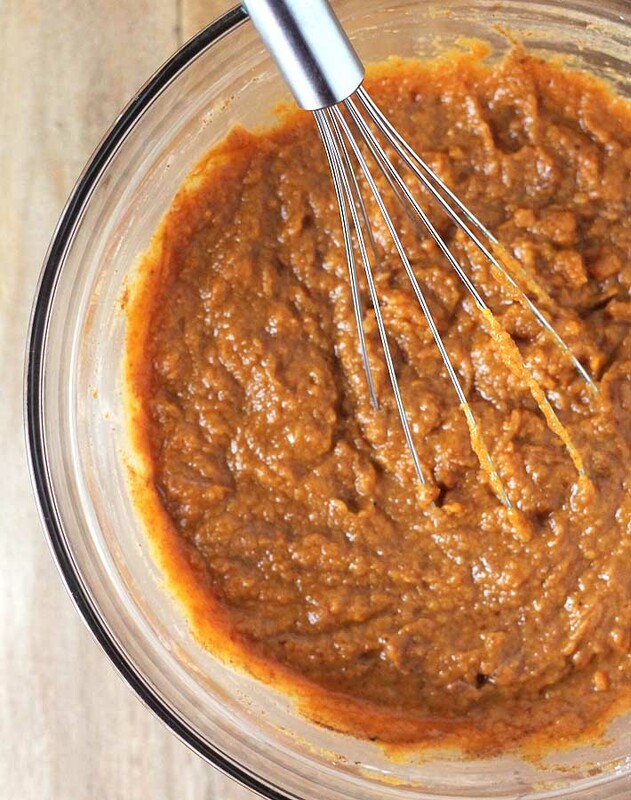 The reason why is if you use pumpkin pie mix, you have no control over the sweetness and the spices (and some of the strange extra ingredients). So this is why I prefer to use plain, pure pumpkin puree (click here to learn how to make homemade pumpkin puree) and build the flavour myself. In total, it takes 5 minutes to prepare the filling, that’s it! Pre-made vegan pie crust may not be so easy to find, depending on where you live. Check your grocery store, Whole Foods, Trader Joe’s, or your local health food stores. If you still can’t find a vegan pie crust, you can pre-make your own. This is a good vegan pie crust recipe to try and the crust I use in my vegan chocolate pumpkin pie recipe is both vegan and gluten free and can be used with this recipe if you’d like. Keep in mind that making your own crust will add time to this recipe and it won’t be as quick). If you do opt to make your own crust, to save time, make the crust before the big day and have it ready and waiting for when it’s quick and easy vegan pumpkin pie making time! And…to make things even easier for you on the big day in the kitchen, make your pie the day before so you don’t have to worry about it the day of. 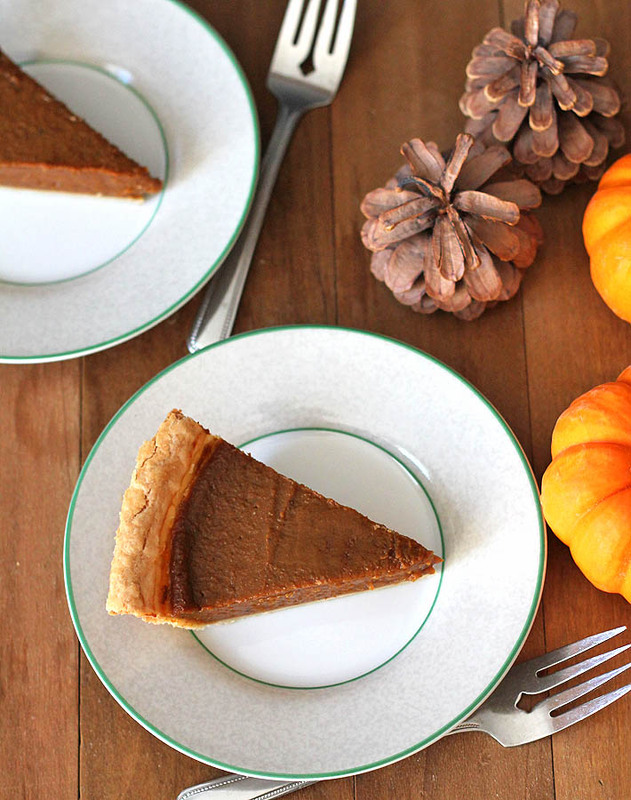 Adding a topping to your pumpkin pie when you serve it is totally optional but highly recommended! I personally love to have a big drop of coconut whip on top (learn how to make coconut whip here) but it’s up to you. 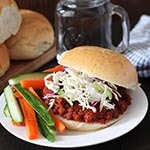 If you do go with coconut whip, you can also prepare it the day before so it’s ready and waiting for serving time. Click here for more of my delicious pumpkin recipes, sign up for my newsletter to receive all of my new recipes in your inbox, and finally, be sure to follow my Vegan Holidays Pinterest board for more holiday recipe ideas! 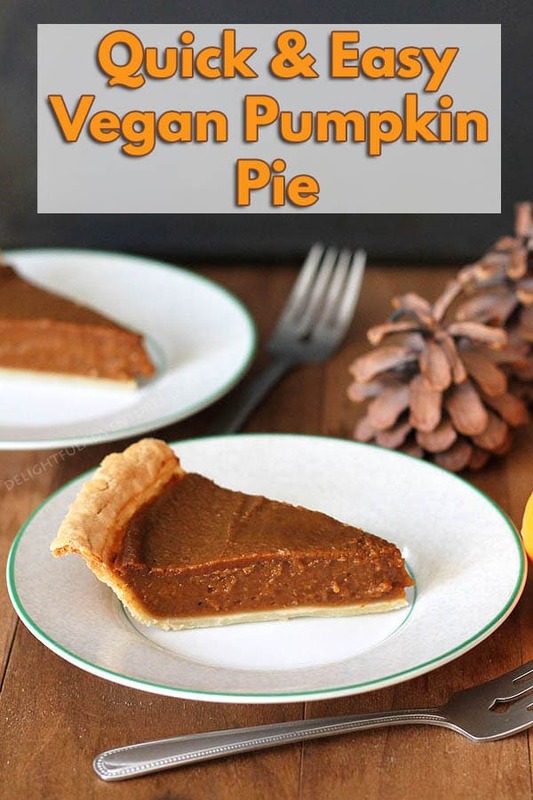 This Quick and Easy Vegan Pumpkin Pie recipe will save you lots of time so you can move on to other things when cooking multiple dishes during the holidays! Combine pumpkin puree, unsweetened non-dairy milk, coconut sugar, arrowroot starch, pumpkin spice, and salt in a large bowl. Whisk all ingredients together until well combined. Pour pumpkin mixture into the unbaked pie crust and smooth the top with a rubber spatula. Remove the pie from the oven and place on a cooling rack. Set aside to cool until it's time to serve. The pie may still be a little wobbly in the middle when you take it out of the oven, not to worry, it will firm up as it cools. Homemade pumpkin puree tends to be a little more runny than canned. 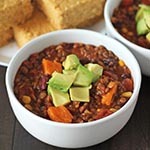 If you are using homemade puree and it's a little runny, bump the arrowroot starch up to 2 1/2 tablespoons. If you don't have pumpkin pie spice, use the following spices in its place: 1 tsp cinnamon, 1/2 tsp ground ginger, and 1/4 tsp ground nutmeg. Calorie count is for 1 slice of 8 and does not include any garnishes. Nutrition data is only to be used as a rough guide, click here to learn how nutrition data is determined on this website. Ok 2 things!!! 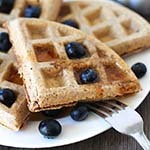 Can I replace coconut sugar for sugar and can I use cornstarch in replacement for arrowroot? Hi Astreja! Brown sugar can be used to replace the coconut sugar, no problem, and yes, you can definitely use cornstarch instead of the arrowroot 🙂 I hope you like the recipe, let me know how it goes!